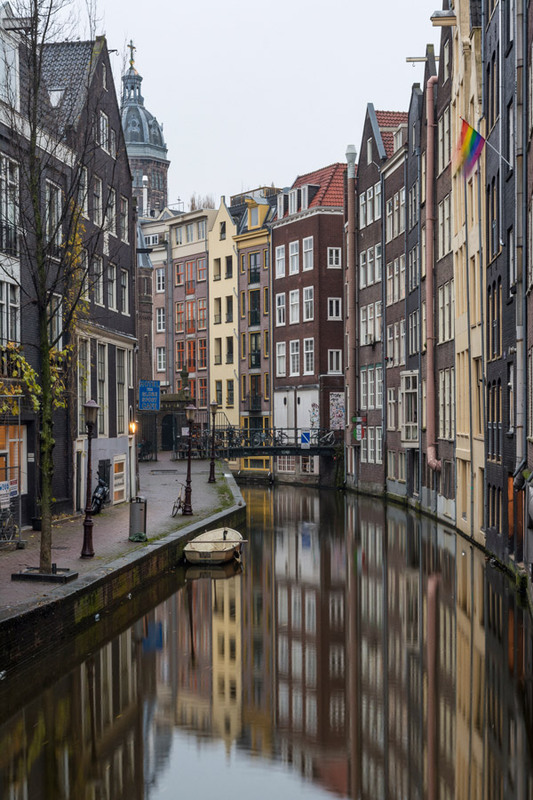 Amsterdam is quickly turning into one of Europe’s most beloved cities, as well as one of the most visited. There is a lot of information about the city around, but some of the things we loved the most aren’t always featured on the lists we’ve seen. 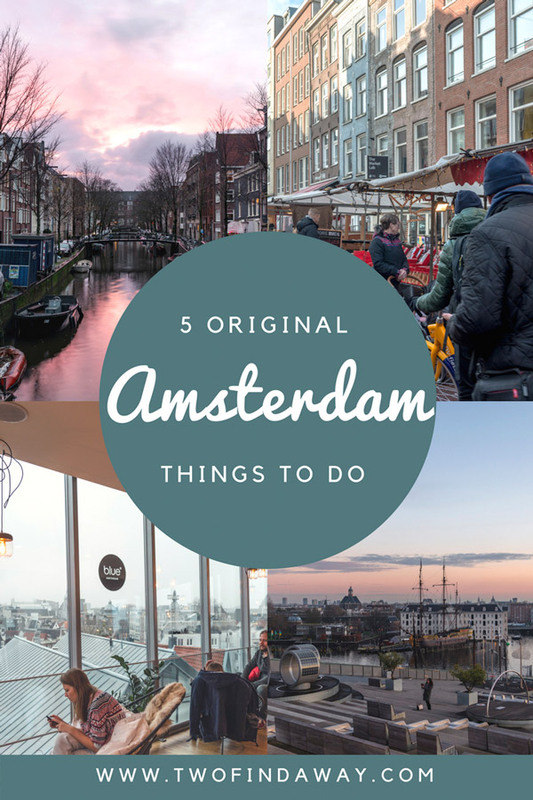 That’s why we decided to put them together on this post: the 5 things you have to do in Amsterdam. The whole city of Amsterdam feels like a hipster paradise, but with the amount of tourists and ho(s)tels signs it can get overwhelming and crowded. Yes, even when you’re a tourist yourself. In De Pijp you get all the things you came to Amsterdam for, with a much more local feel. 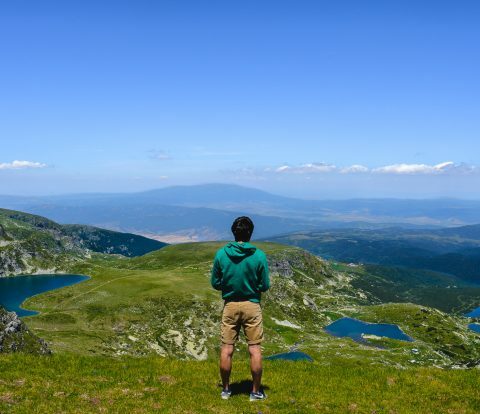 When you look around, you can actually find some locals. Don’t take us wrong, we love some touristy things… But when we visit a city we like to feel like that we actually got a taste of the city life. 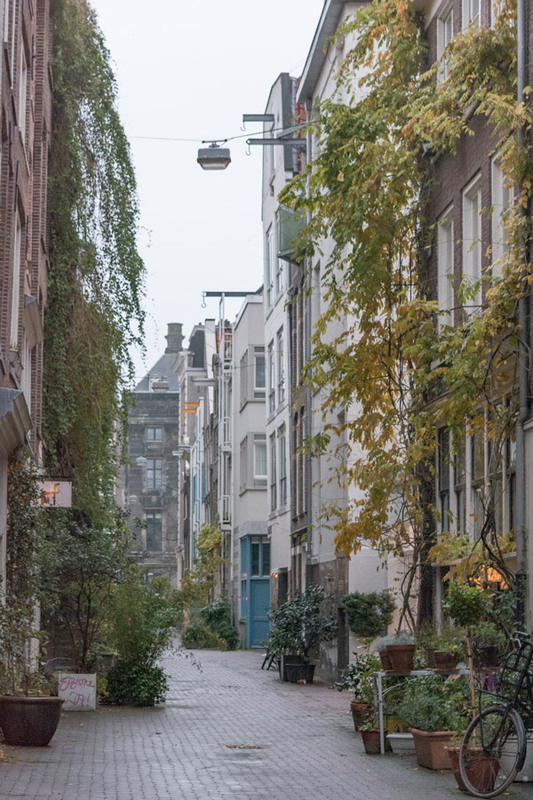 It is extra special in Amsterdam because when you get out of the crowded center, chances are you’ll feel like you really could live in the city. The architecture is beautiful, the vibe is great and maybe someday you might find a way to actually ride a bike without getting run over by other bikes. 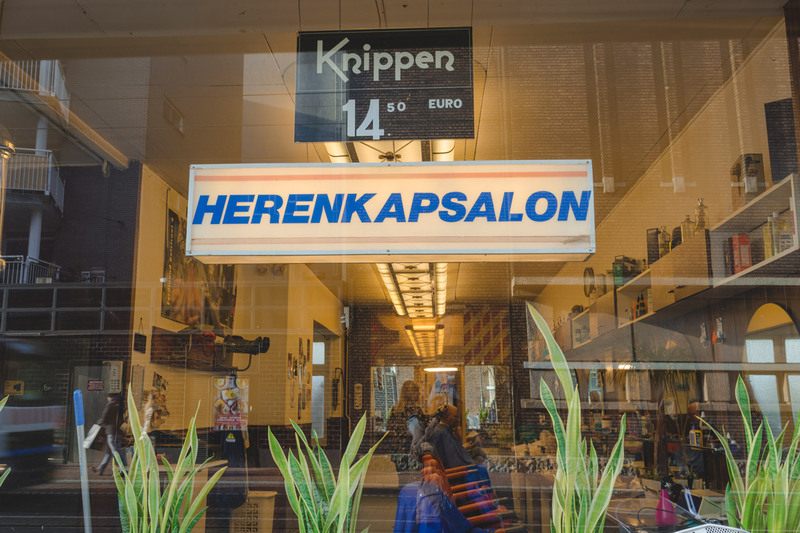 It is also in the De Pijp that you’ll find the Albert Cuypmarkt. 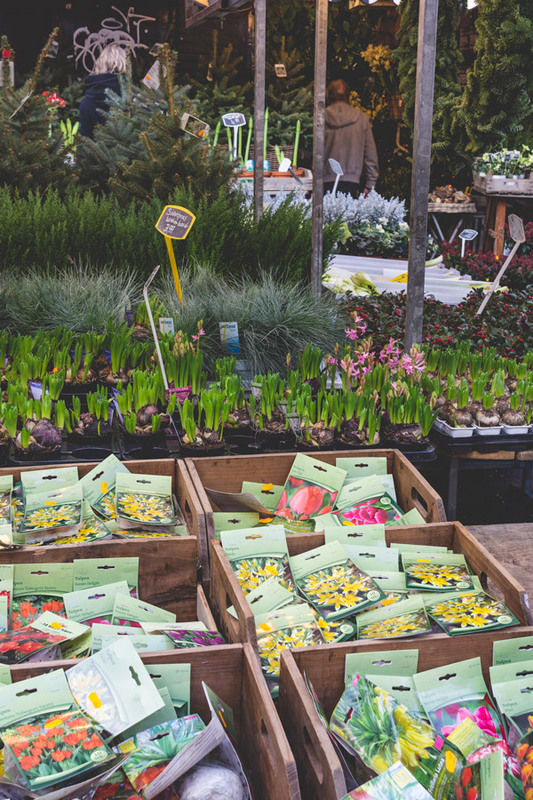 We are a bit biased because we love to visit markets, but this one is worthwhile. Truthfully, it is mostly for tourists… You’ll find all the souvenirs you don’t need, along with the ones that you do (we mean cheese). But somehow it maintains a bit of a local vibe as well, the prices aren’t crazy and the food is delicious! The market is open Monday to Saturday from 9:30am to around 5pm. 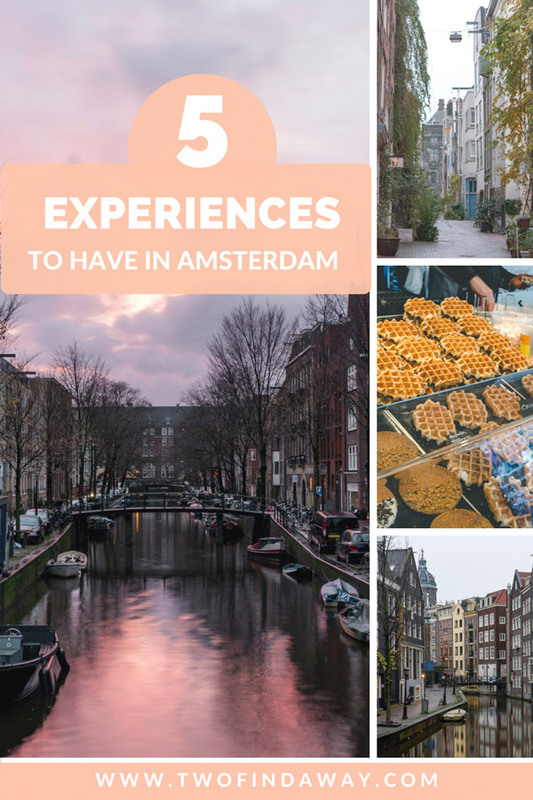 We know this is something you read in almost every city guide… But Amsterdam is many times the exception. 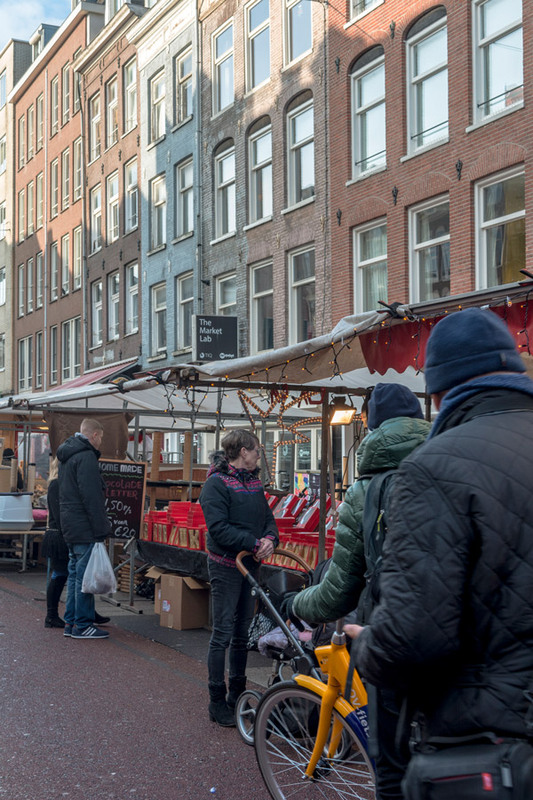 The reason is that the Dutch cuisine isn’t necessarily world-renown, and most of the guides you’ll read we’ll probably incite you to try some international food when in Amsterdam. 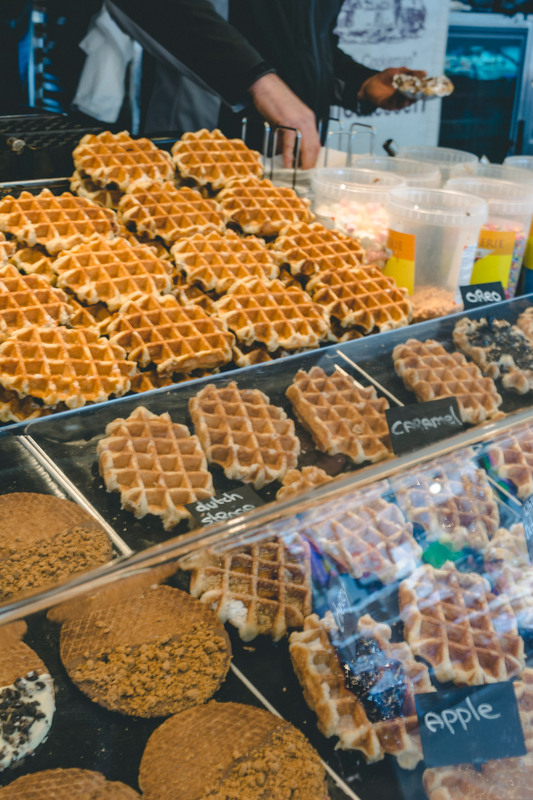 We think international food is great, but we want to give a nod to Dutch food too! So what exactly should you try? If there’s one food the Dutch are known for is the sweets. The two most famous national types are the poffertjes and the stroopwafels. The latter you can find both fresh (which ironically means warm) and packaged at the Albert Cuyp market we mentioned above. As for savoury treats, trying the raw herring is definitely an experience. 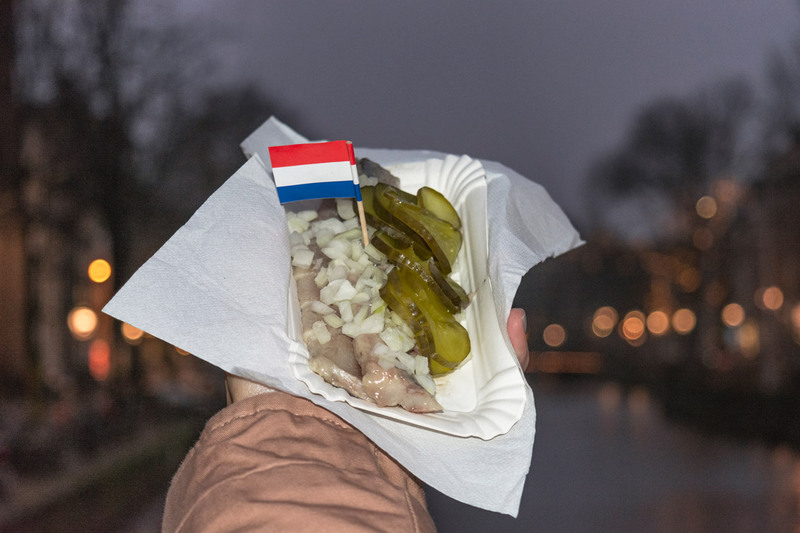 It is sold in street stalls all over the city, and it can be a nice snack as you’re crossing the city (there is a lot of walking to be done in Amsterdam). However, we don’t necessarily recommend it if it’s super cold outside (well, Rui does not recommend it in any circumstances)… it can be too much (speaking honestly from experience…). If you’re more into warm and less healthy snacks, don’t miss the bitterballen. 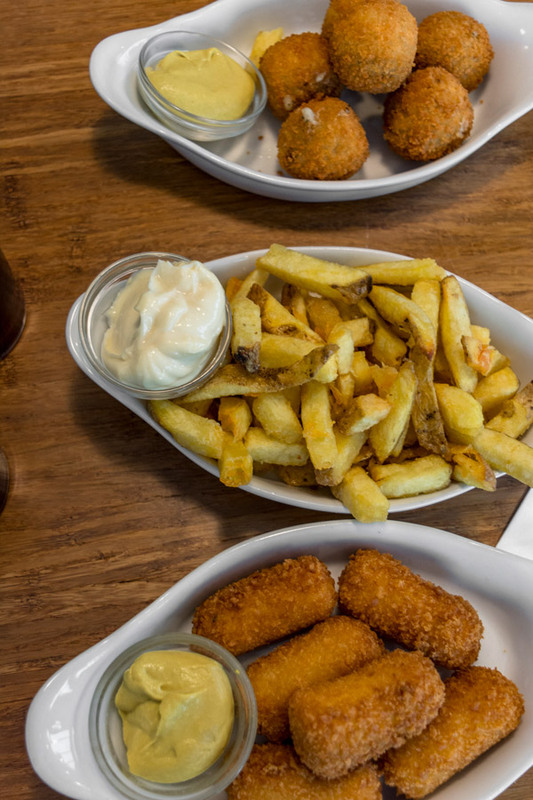 A traditional experience is to have them from a machine in one of the FEBO stores across the city – they are inexpensive, warm and tasty, plus there’s some variety to choose from. 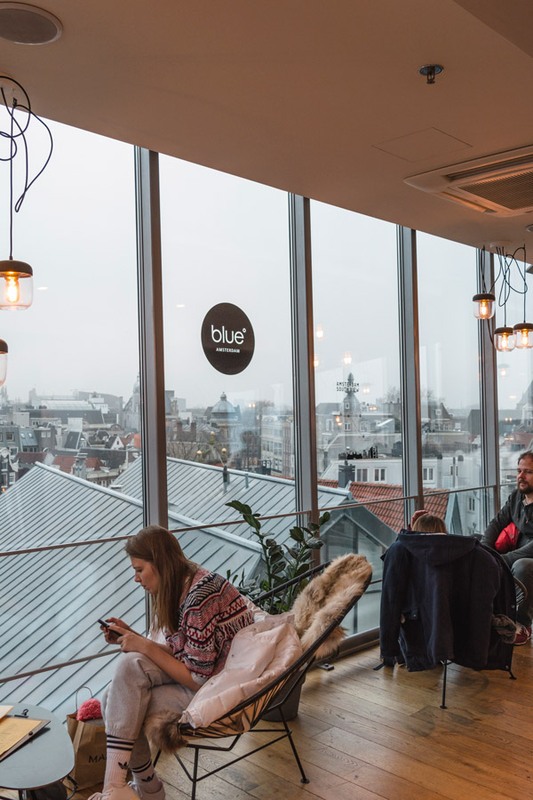 Nevertheless, if you are more into a sit-down meal (and some rest time), we recommend Blue Amsterdam. Yes, we only had fried foods when we visited this place. But do not fear, it has plenty of healthy food on offer as well. However, the main reason to visit this cafe/restaurant/bar is actually not the food. The cool decor could also be the reason, but we are actually referring to the panoramic view over the city. Amsterdam is one of the world’s flattest city, so it’s not like you can just climb to a hill to find a view. The next best alternative? Blue Amsterdam. 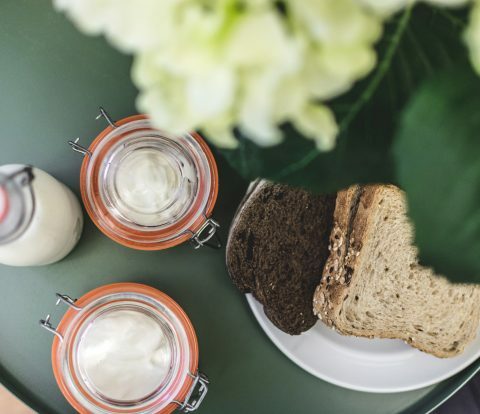 Whether you’re looking for breakfast, for a meal, or just some drinks and snacks, this is the perfect place. And surprisingly, it’s not as expensive as you’d think considering it’s smacked in the center of this pricy city. We went there for lunch on a Saturday during low season and it was very busy. Thankfully, we were able to get a table in a few minutes. Nevertheless, we recommend you book one if you plan ahead, it’s rather simple to do online. You can find Blue Amsterdam at Singel 457, it’s opened from Monday to Sunday. Check their website for specific opening hours and to book a table. 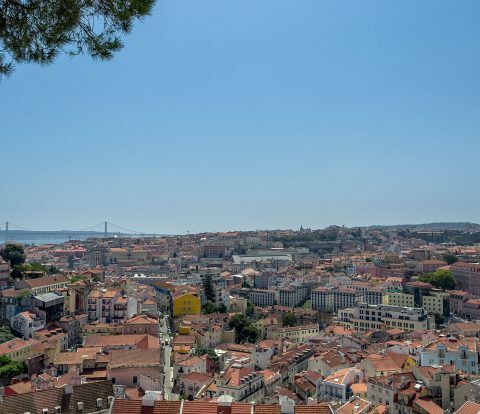 One of the reasons we recommend you get a panoramic view of the city is because its architecture is worth staring at for hours. That is why wandering and taking long walks by the canals is a thing you must do at any time of the day. 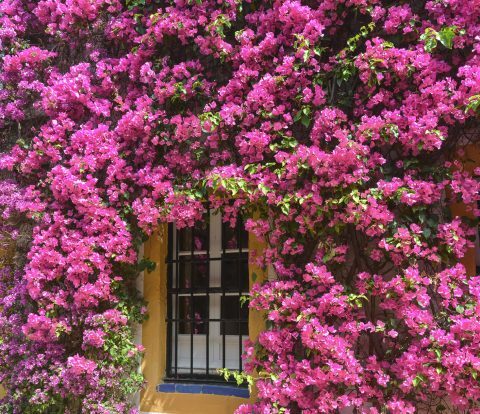 It will be hard to decide whether to look up to the houses, or down to the canals… The best option? Look around to make sure there is no bike coming your way. Security first, are we right? Also, as we mentioned above, tourism is booming in Amsterdam, so it’s bound to get crowded. Yes, even in the low season. So our best tip? Wake up early and explore the city before everyone else does. We would like to include something along the lines of “watch the sunrise”, but chances are there won’t be much sun to see in the morning. This was our experience, but you might be luckier. 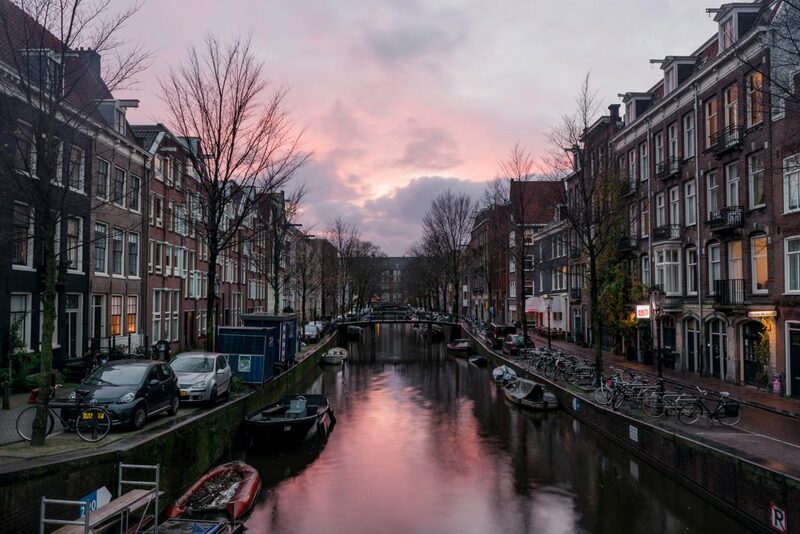 Nevertheless, no matter how grey it gets, we guarantee it is worth waking up: you get the most iconic canals all to yourself and seeing the city wake up is an experience by itself. 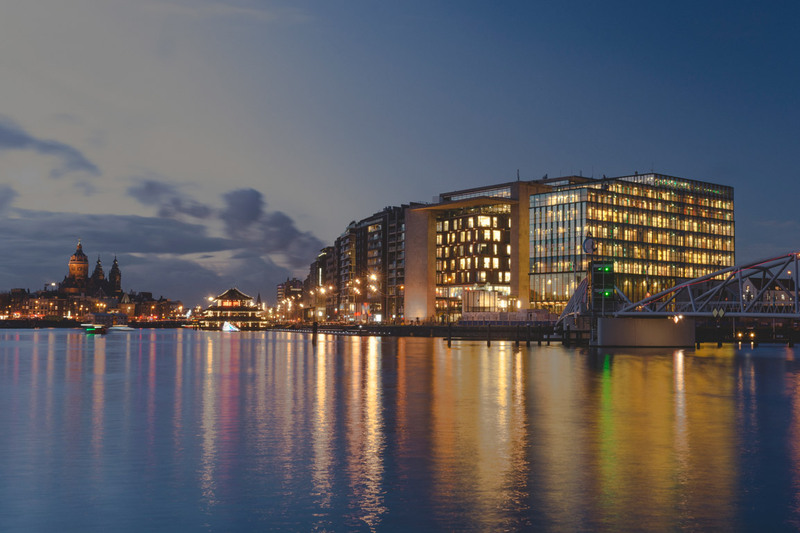 We are inviting you to visit Netherlands’ highest city square. 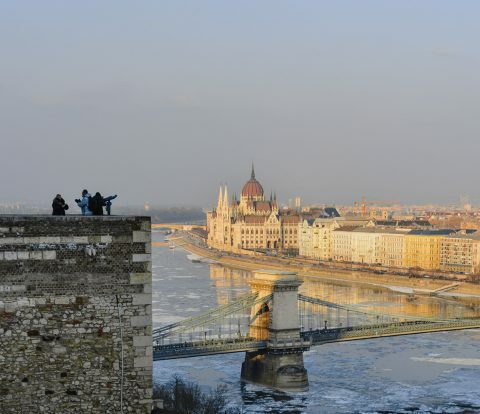 This rooftop is the best place to sit down and relax after some sightseeing or some museum exploring. It is absolutely beautiful and unique. Plus, it is perfect if you’re a curious being: there’s so much to see and to learn. The roof actually has its own interactive exhibition, but we must admit that we spent most of our time there mesmerized by the sun setting over Amsterdam. Besides the amazing views and the exhibition, you can also find a restaurant up there (we didn’t try anything, but it looked beautiful from the outside!). If you follow our advice and go to this roof, take some extra time to visit Amsterdam’s Central Library. 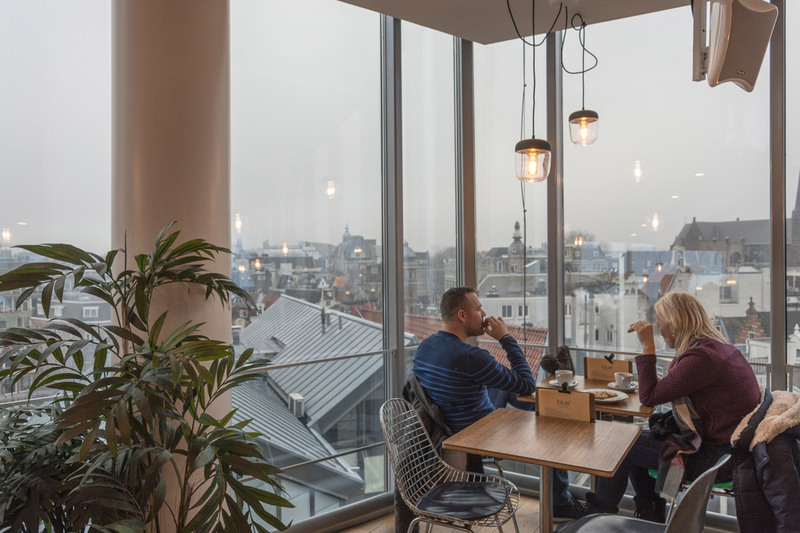 Not only is it an architectural gem, but from the inside you can also enjoy a view to the city as well. 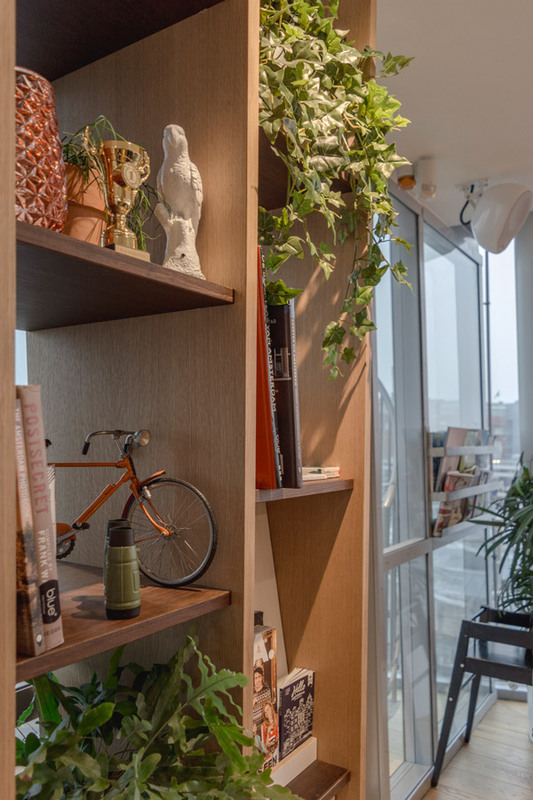 There are (of course) plenty of books and even a cozy cafe to go with the view. 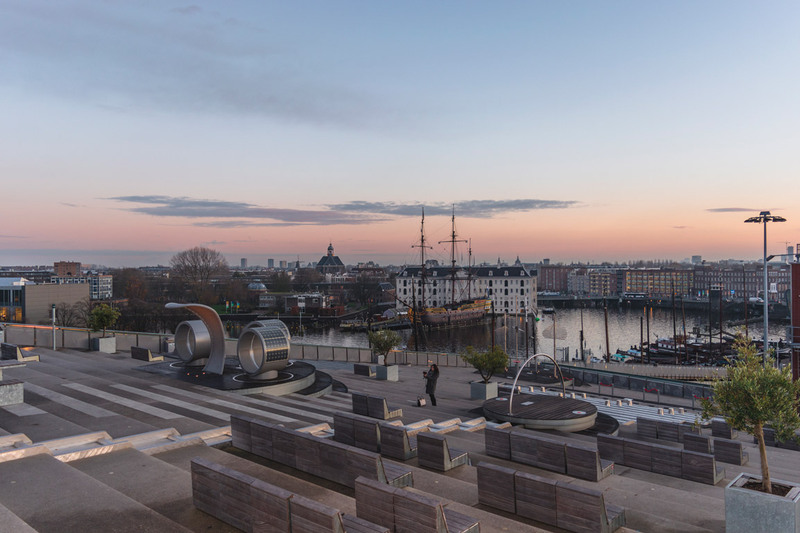 Visiting the terrace is free and it can be reached from the stairs at the street level or by a lift from the museum. 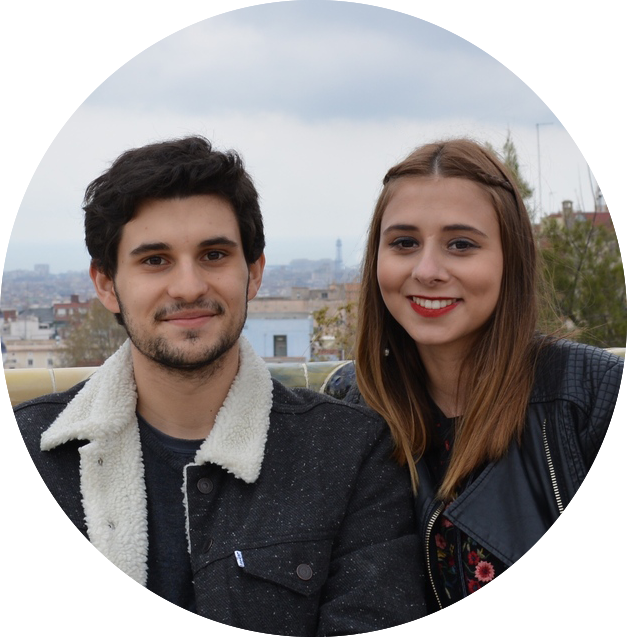 We visited the city last Autumn and absolutely fell in love, as most people do. There are other must-visits in Amsterdam, but we tried to keep this list original. 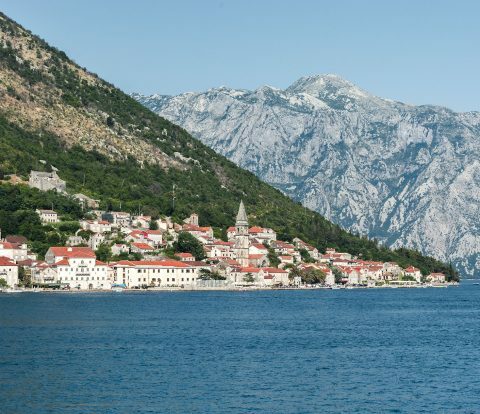 Plus, we’re sure you’ve heard of these places if you are considering a trip to the city. We visited and loved many of them, such as the Anne Frank’s Haus, the Vondelpark, and the beautiful Bloemenmarkt. 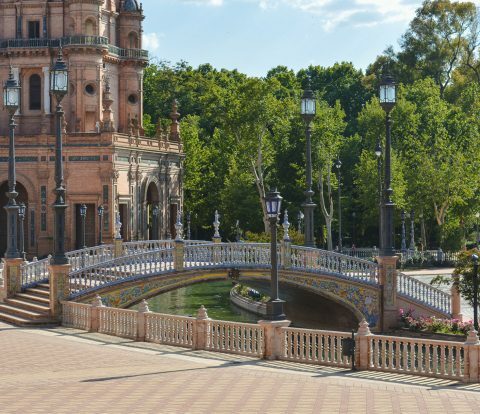 There were somethings on our list that we didn’t find time to explore this time, namely the city’s windmills and the botanical gardens. Those will be at the top of our list next time! Check out the stories from our 3 days in the city on Instagram @twofindaway. Have you visited Amsterdam? Share with us your favorite places below because we’re hoping to go back soon! Also, don’t forget to pin this post for later!